Oh I can’t believe this is the last week. I have been under the spell of this Season. My book is almost complete! I’ll be sharing a flip through on July 29th. 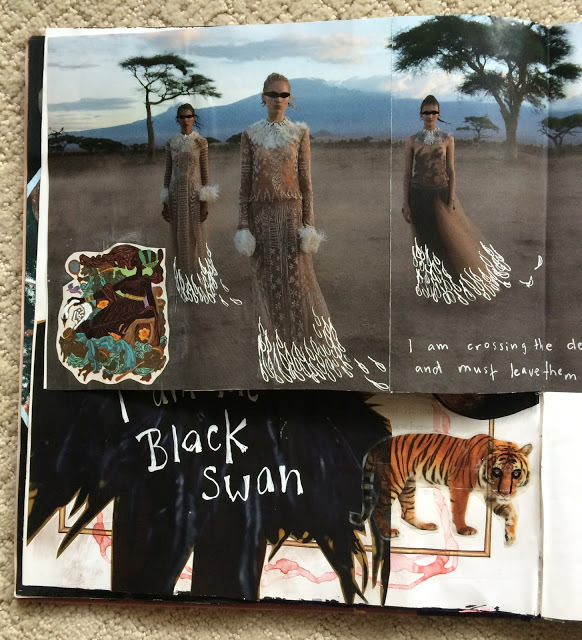 And next week there will be a blog hop and I’ll be sharing some tips on how to alter a book. Here is my first spread for the week. A lot of elements here are linked to earlier pages in this Season. First though, the image of the woman on the right is the backside of the red robed woman holding the clementine in last week’s spread. 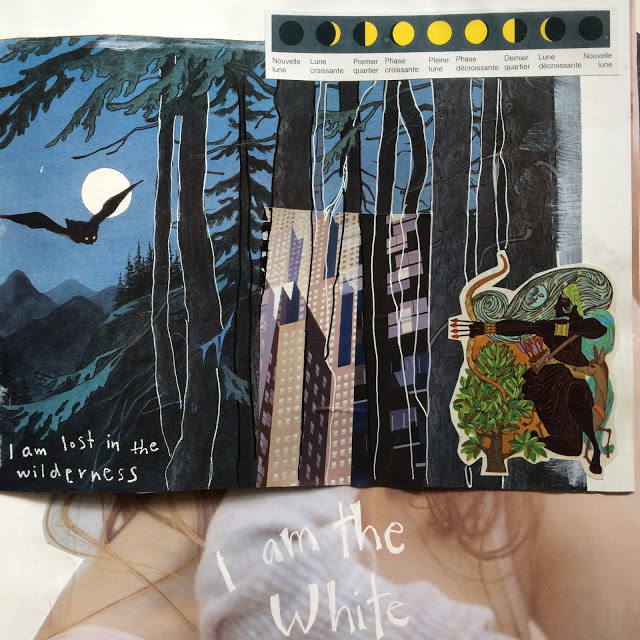 I though the back page looked really cool and loved the colors so I stuck it in my book, highlighting the moon and the swans that were already on the page. My Mystic Jackalope came by (just click on the tag to see more versions of him). 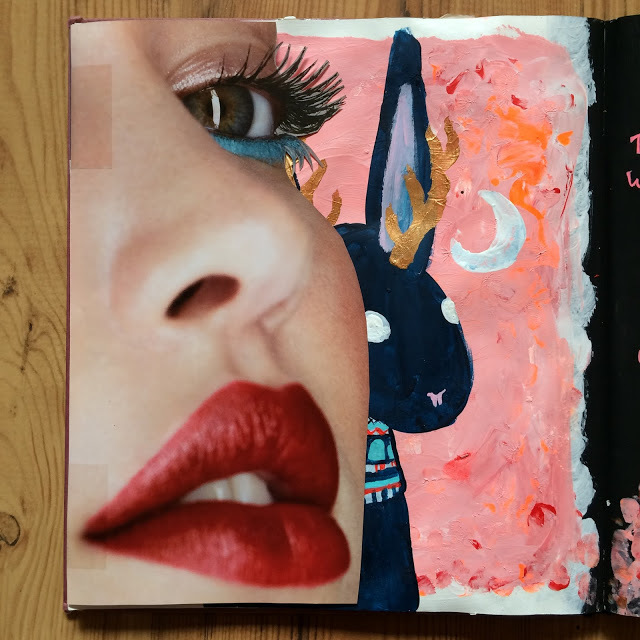 I used some of the same colors as those in the woman’s coat to link the pages. The background I painted with my fingers, gesso and some acrylic inks. This was done after I took Amy Maricle’s Freeing the Muse mini-workshop. I love how Amy talks about art in her videos and I encourage you to check her out. The tears falling from the woman’s eyes recall the page I did about seeing the raccoon mother. 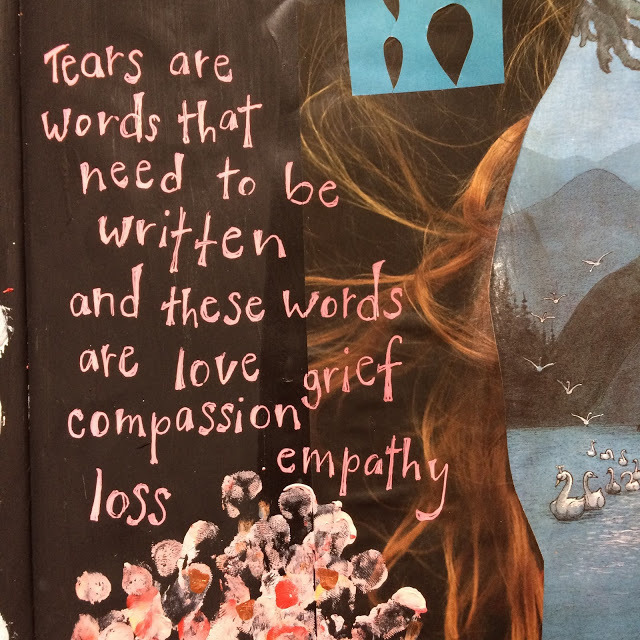 I think this brings a nice cohesiveness to my altered book, especially since these are the emotions that make me cry. 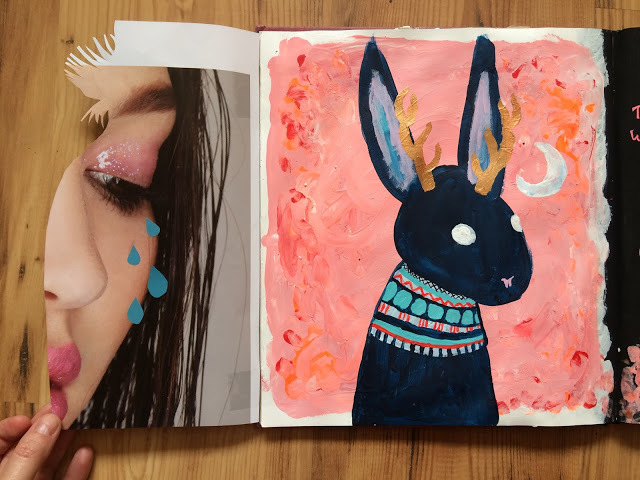 I chose this image because the colors were fitting and I liked how it only obscured part of the jackalope. I wanted to write ten words about me on the back but loved the image too much and decided to go with simple tears instead. I attached this flap with packing tape! This spread is the very last one in this Season. It is for the prompt about ten words that represent you now. I didn’t do the timer part of the prompt (I like spending lots of time on my pages). 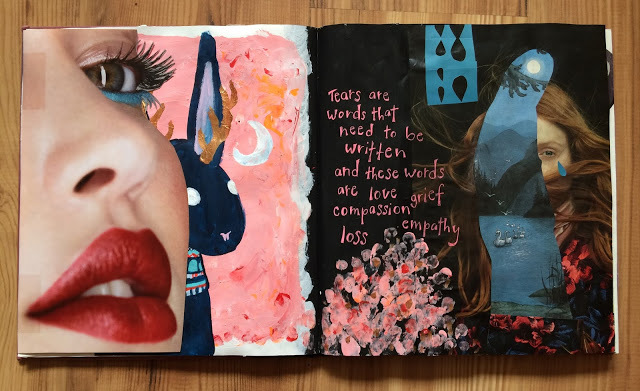 I did a two-part spread over four pages. 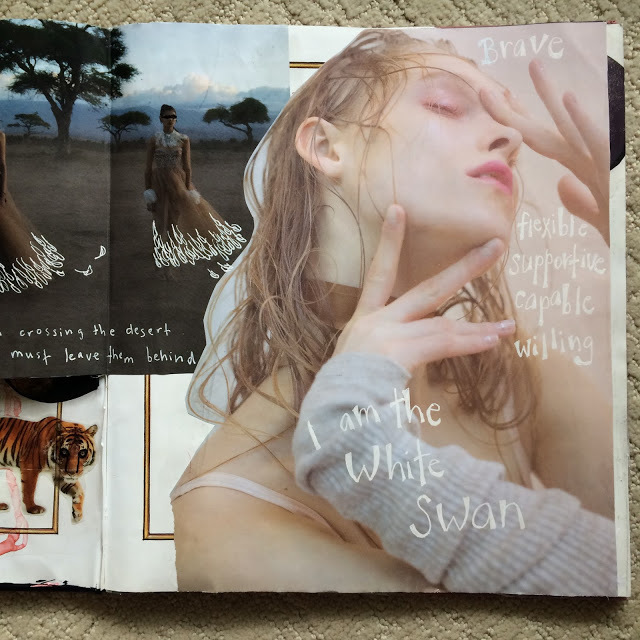 I decided to work with the theme of my altered book, Swan Lake. 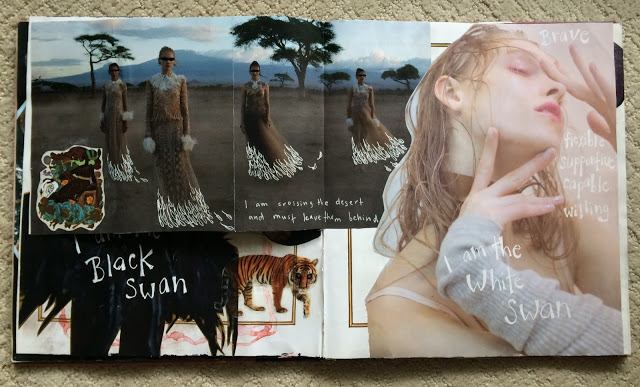 The first five words describe the Black Swan part of me and the last five the White Swan. 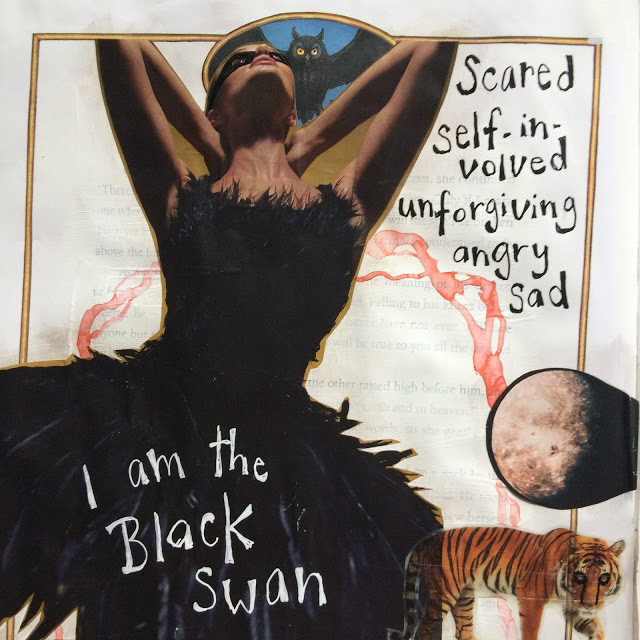 The Black Swan represents the darker aspects of my emotions concerning my move to Beijing. I paired it with the image of the woods on the right. 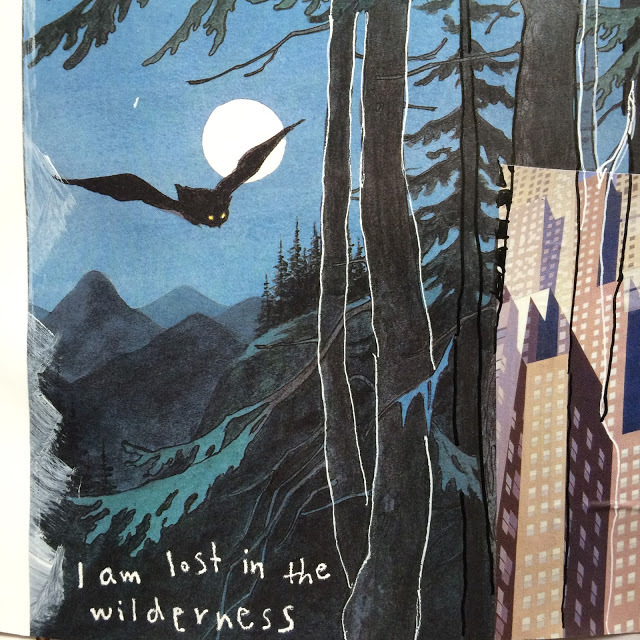 The ‘wilderness’ is a metaphor for being lost in a new environment that you have trouble adapting to. Notice the drawing of the high rises, the moon phases and Artemis, all symbols that support the symbolism of this page. The back part of this same half-page shows the rest of the swans (my friends, my colleagues) and Aphrodite with her own swan. 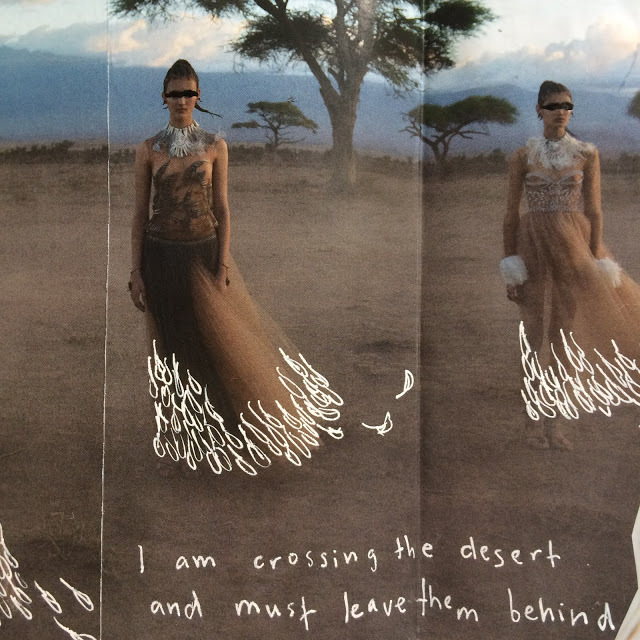 I am crossing the desert in the sense that I must start anew, new friends, new context, new everything. There are good and bad sides to this as well. And finally, the White Swan part of me and this move. I am able to adapt although it never comes easy to me. In the end, good things shall come of this. And this concludes this Season! 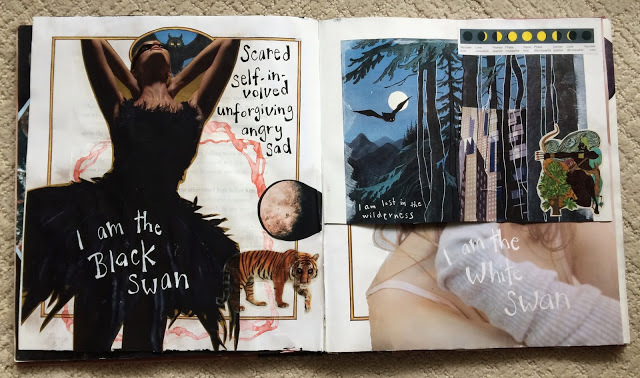 I have completely filled my altered book. Next week we are having a blog hop. 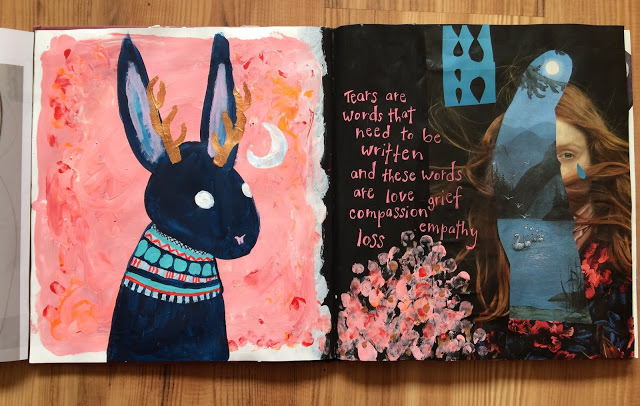 On the 29th, I will be sharing a flipthrough of my complete journal. I hope you’ll come by! I've looked & read your pages so many times…they're just super awesome with so much detail!